The cornea is the clear window on the front of your eye. It focuses light from the entire world onto the retina, a living tissue about the size of a postage stamp at the back of the eye. 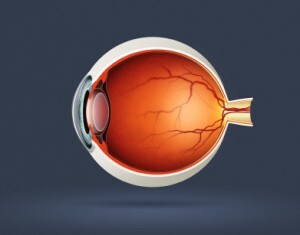 The retina translates that light into vision. Cross section of the human eye. Light entering through the cornea on the left comes to focus on the retina on the right. The cornea is a remarkably complex tissue supported by numerous components and mechanism all of which must work in perfect concert to maintain the clarity of the structure and to provide good vision. Everything from aging to injury to disease can work to disrupt the delicate balance of the clear corneal tissue threatening your vision. What follows are some of the more common corneal problems we see in our contact lens practice. This information is intended to help you understand what might happen to eyes should they be impacted by these diseases and dystrophies. Every patient is unique and individual responses vary widely. This information is not intended to diagnose or treat eye conditions. Have your eyes examined annually.